Regardless of whether I’m working on a creative project for a client or for JustineCelina, I always start with a moodboard to collect inspiration and solidify my ideas. Especially with a large project like a living room, it’s can be easy to get overwhelmed — a moodboard helps to keep you focused on the look and feel you’d like to achieve. For our Living Room Refresh, I pulled together key furniture pieces, colour palette, plants, textiles and accessories. Although plans changed as we moved through the design process (we ended up going with a few different furniture pieces and plants than I had originally planned on — more about that in upcoming posts!) you can clearly see the how the moodboard served as a the cornerstone of the design process. It was a lot of fun to look back on the original inspiration for the space now that it’s complete! My partner and I both lead very busy lives and our home is our sanctuary. It’s also where I live and work — so creating a warm, inviting space where we can relax, unwind and hang out with friends was really important to me. My ultimate goal was to create a comfortable, creatively inspiring room brimming with good vibes and positive energy! As I mentioned in our paint transformation post, our 1500 sq ft apartment is 6 years old and we purchased it from a builder who was inspired by earth’s natural elements. That inspiration was one of the reasons I originally fell in love with this apartment (plus, you should see the master closet!) — so I used that concept as my inspiration for our SPACE REFRESH as well. Opposites attract, and that couldn’t be truer for Adam and I — from our professions to our personal style and design preferences. I’d describe my design style as modern, eclectic and a free spirited, while Adam’s sensibilities are rooted in tradition, comfort and practicality. Although we’ve lived together for a long time, this is the first room we created together essentially from scratch — and to my surprise, we were actually able to agree on the overall aesthetic pretty easily (another case for making a moodboard — it helps communicate your ideas visually!). We met in the middle on a mid century modern inspired space — which I truly believe is the perfect mixture of contemporary and traditional. We both love the warm woods and natural textures built into the space, so I drew on those materials to make our dream Living Room a reality! I believe homes are meant to be lived in and fully enjoyed — and there’s a lot of living (and working) that happens in this space! Neither of us like spaces to that look too polished or precious. Because of my passion for DIY and making things with my hands, it was important for me to include a lot of handmade items (I actually made that tree stump side table — post coming soon!) and foraged pieces (all the driftwood in this space is from my friend Kelsey’s lake, where we’ve spent many girls weekends over the years!). So, in keeping with the natural elements theme, I selected textures, materials and flora found in nature that age gracefully — including wool, leather, wood, marble, stone, crystal and purifying salt (hop over to this post to read more about their health benefits) with lots of air cleansing plants — plus some fresh springtime blooms masterfully arranged by Rebecca Dawn Design to bring the space to life. One of the main reasons I love shopping at HomeSense is because I can find everything I need to finish a space and make it feel like home! Plus, I can find incredible pieces at incredible prices — and that’s exactly what happened as our living room came together. I purchased everything — rugs, lamps, mirrors (I snagged our gorgeous circular mirror on clearance for just $70! ), artwork, planters, baskets (at $29.99), poufs (our velvet pouf was just $49.99! ), throws, pillows (from $19.99 – $29.99), candles (as low as 9.99! ), vases ($12.99 and up), serving trays, crystals (these are a major steal at $14.99 – $29.99! ), coasters (our marble set was just $12.99!) and glassware (usually between $2.99 – $6.99 a piece) at HomeSense. Although the large macrame wall hanging behind the couch was DIY project, I found all of the tapestries I used to make it at HomeSense for under $50 (yes, really!) — and I’ll be sharing exactly how I made it in a dedicated post! HomeSense is my first stop for decor and entertaining essentials because of the unparalleled value and variety. If you’ve been with me for any length of time, you’ll know I love unique pieces and great deals when it comes to personal style — that definitely translates to home decor as well! I love the hunt — and I’ve honestly lost track of how many HomeSense runs I made as this space came together, but every single time I stopped in found a new piece (or 7!) to fall in love with. With online shopping being more prevalent than ever, HomeSense is one of the few brick and mortar stores that I still really enjoy shopping at — I love the thrill of finding a beautiful, unique piece and snapping it up before any one else spots it (or it sells out when I hesitate, never to be found again!). Although I’m pretty experimental when it comes to my wardrobe and my beauty routine, I actually like my home to be fairly neutral. Having a neutral base in a room allows me to change up accessories and accents without limitation — and as someone who’s constantly inspired by colours, trends and textures, that’s a must for me! I also love to refresh accessories seasonally — and right now, it may still be winter outside (there was actually a massive blizzard on the day I shot this post! ), but it’s spring inside! I love having fresh flowers in our home whenever possible — I think they completely change the energy in the room. So, I asked Rebecca to create two fresh, spring inspired arrangements for our reveal (I’ll also be sharing them in more detail very soon!). I love the cheerful pop of colour they add the the space — and since this room is neutral, it’s going to be a lot of fun experimenting with different flowers and colour palettes as we move through the seasons. From home decor to personal style, I love an eclectic, layered aesthetic. Our living room features mixed metals and lots of natural, layered textures to achieve a laid back, homey feeling. Layered rugs are trending at the moment — and they’re a great way to experiment with texture and colour in a space by keeping your area rug neutral and having fun with your smaller layering rug! Our new couch and armchair are extremely comfortable, but my favourite spot in any living room is actually perched on the floor, cross legged. So I brought in lots of relaxed, alternative seating and a pouf to set up around the coffee table. Since we live an apartment, having versatile seating options was another priority of ours — it’s also the reason why we transitioned from a sectional to a couch and armchair. There’s nothing worse than company feeling cramped in a space with awkward seating! One of the main issues in previous living room set up was storage. Although we have decent square footage, we looked for pieces with lots of concealed storage to keep the space clean and relatively clutter free. I love being able to style our coffee table and sideboard with a few pieces of decor I can switch out depending on the season (or my mood!). Neutral vases, salt lamps, natural stones and crystals, plants, candles and gorgeous hardcover books are a few of my favourite little luxuries to finish a space and create an inviting atmosphere. Another way we played with texture in this space was with pillows and throws. HomeSense is my favourite place to shop for unique throw pillows and faux fur accents — and I love the way all these different textures against the warm leather. From Mongolian lamb, to macrame with metallic thread, to velvet, to wool, to fringe — you’ll find it in our living room! Since the colour palette is neutral with pops of blush (see, I told you I can’t get enough millennial pink! ), I felt like we could really have fun with the textures in our space to make it feel warm and cozy. I love curling up with glass of wine in front of the fireplace after a long day! Although this project took much longer than we originally anticipated due to some furniture delays (our couch and chair were back ordered and took a couple of months longer than expected to come in! ), it was actually a blessing in disguise and we couldn’t be more thrilled with the way it came together. Taking our time while we waited for our furniture to be delivered and mindfully curating each piece of decor that we brought into our Living Room has made it so meaningful for both of us — I know it’s a space we’ll enjoy for years to come. Thanks for stopping by for our Living Room Reveal today, friends! I really hope you enjoyed learning more about the inspiration behind the space. Although it was a lot of hard work, enjoying our refreshed living room has been an absolute dream! 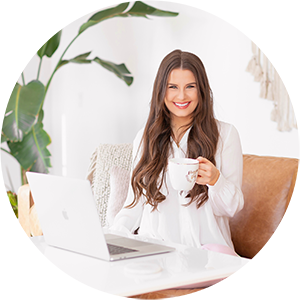 I have so much more to share about the process and all the details that went into this space — so if you love interior design, decor and styling, be sure to check back often for new posts this spring or sign up to have my content delivered straight to your inbox (there’s a blue bar at the top of the page where you can enter your email address!). Next up in our SPACE REFRESH series is our kitchen, dining room and bar — which is adjacent from this room. If you like, you can also follow along with my Home Pinterest Board for more interior inspiration, or the JustineCelina Home board where I’ll be pinning our refreshed spaces and other DWELL content as it rolls out. As always, if you have any specific questions or requests for upcoming content, just leave me a comment! Enjoy the rest of your week, everyone — spring is just around the corner! Thank you to Apartment Therapy, Brit + Co, Daily Dream Decor, Elle and Hunker for featuring our refreshed Living Room. Looks amazing Justine…entirely liveable and cozy. Maybe you should do my house next? I still feel like I’m living in a uni dorm room sometimes. What a beautiful space! It turned out so lovely Justine! Thank you, Shaerba! We’re so happy here. I’m glad you enjoyed the post! Wow, it’s stunning. Love how you brightened it up while still keeping it warm and cozy! I am so happy this all came together so beautifully for you and Adam. Honestly, I was stressed about the furniture delays (and you having to live without a couch) when you told me about the fiasco over drinks. However, you proved that good things come to those who wait! What an energising, fresh and timeless space you have put together. Excellent use of plants, too. That’s what my living room needs more of! Thanks so much, Amanda! There were definitely parts of this process that were stressful, but I think that’s bound to happen with any reno. I’m actually planning a post all about our furniture and the whole backorder situation — although you already have the inside scoop! Haha. I’m also planning a post about selecting the best plants for your space. I think I’m turning into a crazy plant lady! Thanks for stopping by today, girl! Oh wow…. what a lovely living room. It has this perfect balance of bright and airy, yet cozy and welcoming. Oh, and the subtle nod to macrame in a few of your pieces is so retro and yet so fresh. Love, love, love. I’m in the middle of refreshing my living room with some new pieces now that we’re finally done our big renovation… based on this post, it looks like I should be spending a little more time checking out my local Homesense for some gorgeous accent pieces! Thank you, Isabelle — that’s exactly what we were going for! I’ve always been a vintage lover and am definitely drawn to retro sensibilities, so I knew I wanted to include some macrame. It’s such a fun, free spirited texture to play with! One of the reasons I love HomeSense is because I truly feel there’s something for everyone, no matter your style or budget. I hope you find some goodies — if you were local, I could give you the run down on which stores have the best stuff! Haha. Enjoy your weekend! Hey Stephi — thank you so much! And welcome. 🙂 Yes, our dining room chairs and table are about 4 years old. They’re not a matching set or anything, but I’ve pulled the details for you. The chairs are from Bouclair’s now discontinued Atelier line, the Atelier Plastic Dining Chair with Wood Legs. We love them, but you can find similar ones (and at a WAY better price, too) at Structube — their Eiffel Dining Chair with Wood Legs. Our dining room table is the Verona Dining Table from JYSK — it’s gone up in price over the years, but it’s an incredible piece. It’s made from acacia wood and there’s an options to purchase 2 leafs you can add to extend it (we use them when we host large dinner parties!). I hope this is helpful! If you’re interested, our Kitchen / Dining Room is up next in our Space Refresh Series — so you can sign up to receive post notifications in the little blue bar at the top of the page. Stay tuned to Insta Stories to see the space come together and let me know if you have any additional questions!